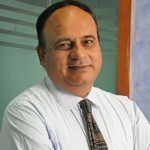 With over 26 years of versatile experience in marketing – both with the corporate and social sectors – Mahesh Kalra is currently heading the Social Marketing and Franchising Division at HLFPPT, being responsible for conceptualisation, planning and execution of its various social marketing and franchising programmes. Prior to this, he worked with Abt Associates on USAID-funded Private Sector Partnerships and Market-based Partnerships for Health Projects, where he contributed to the success of programmes such as WHO ORS Saathi Bachpan Ke, Dimpa Injectable Contraceptive, Condom Bindaas Bol, Health at the Base of the Pyramid and e-Chaupal. One of his major achievements has been creation of 3,550 franchising clinics in Uttarkhand, Jharkhand, & Uttar Pradesh. His areas of interest include health systems strengthening, innovative provider networks and last mile distribution strategies. Mahesh Kalra holds PG Diploma in Business Administration (Marketing) and Graduation Degree in Economics from University of Delhi.